When other sandals hurt, this is the one to try. A lightweight, flexible sandal great for walking. WIde footbed. Removable insole. 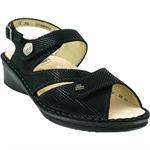 Orthopedic sandals with three adjustable straps for perfect fit. Full heel, orthopedic sandal with adjustable velcro straps. An amazingly comfortable and supportive sandal by Theresia M.
Wolky's most popular fashion comfort sandal.Find out why! 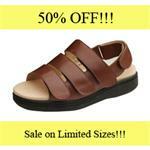 Gladiator style, velcro closure comfort sandal, with removable footbed. Casual slip in with Finn Comfort's soft comfort footbed. Double velcro closure provides adjustability. Finn's renowned 2 strap adjustable slide. Removable insole. 3 strap with patterned leathers. White Milos is imported, non refundable. Thong sandal with removable insole. Web sales only. Sporty slip-in sandal with fabulous footbed.